President George L. Hanbury, Board of Trustees Chairman Ron Assaf, Vice Chair Dr. Barry Silverman, Provost Ralph Rogers as well as college deans and faculty members were recently initiated into a new chapter of The Honor Society of Phi Kappa Phi at Nova Southeastern University (NSU). Founding members signed the charter creating Chapter 345 at NSU during a ceremony on January 9, 2018, at the Alvin Sherman Library. Many of the chapter’s charter members and all new members were initiated into the nation’s oldest and most selective all-discipline honor society. (Some charter members had been previously initiated into the honor society at other institutions). “The values of Phi Kappa Phi are very much aligned with NSU’s core values–including academic excellence and research,” Dr. Hanbury said. 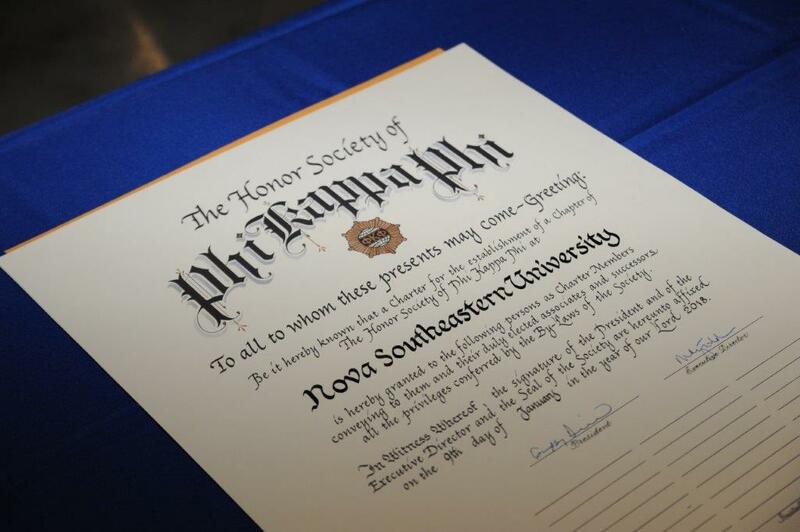 Founded in 1897, Phi Kappa Phi inducts about 30,000 students, faculty, professional staff, and alumni each year from select colleges and universities in North America and the Philippines–NSU is the 345th chapter. Membership is by invitation only to the top 10 percent of college seniors and graduate students and the top 7.5 percent of juniors. The new chapter will enhance NSU recognition and help to attract outstanding students and faculty who contribute to distinctive research. Chapter 345 will begin initiating NSU student members in February 2018. A university seeking a chapter is evaluated on its educational philosophy and institution purposes and the quality of instruction and research, personnel, and facilities. Besides Petrescu, other faculty serving as chapter officers and charter members include Patricia Rose, Sonia Kay, and Rachelle Dorne. Charter members also include President Hanbury, Provost Rogers, Chairman Assaf, Vice Chairman Silverman, Health Professions Division Chancellor Fred Lippman, Farquhar Honors College Dean Don Rosenblum, assistant dean Saul Sztam, professor emeritus Susan Davis, and faculty members Bryan Armentrout, Max Ito, Judith McKay, Timothy Miller, and Glenn Scheyd. Other members include college deans Kimberly Durham, Jon Garon, John Preston Jones, Harold Laubach, Roni Beth Leiderman, David Loshin, Linda Niessen, Marcella Rutherford, Yong Tao, Johannes Vieweg, Elaine Wallace, Brad Williams, Honggang Yang, and University School Upper School Director William Kopas. 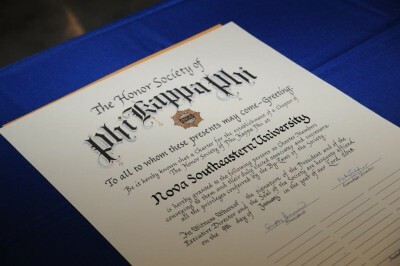 For more information about Phi Kappa Phi, visit https://honors.nova.edu/phi-kappa-phi.html.